Growing up in an Armenian-American household, most of my comfort foods were not the typical dishes one would expect in America. An ingredient that is used a lot in my family is bulgur, or cracked wheat. Many people, even in America, have first experienced this in tabbouleh, which is becoming more and more popular outside of the Middle East. There are so many other wonderful dishes that utilize this ingredient. One of my favorites (and actually one that is quite easy) is sini kofte. In Turkish, sini means "pan" and kofte means "meatball" (although it's easily used to describe dishes that are not formed into ball shapes). 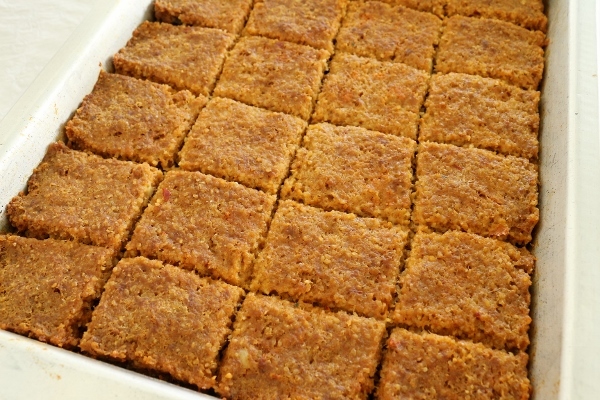 Sini kofte is made with meat pressed flat in a pan. 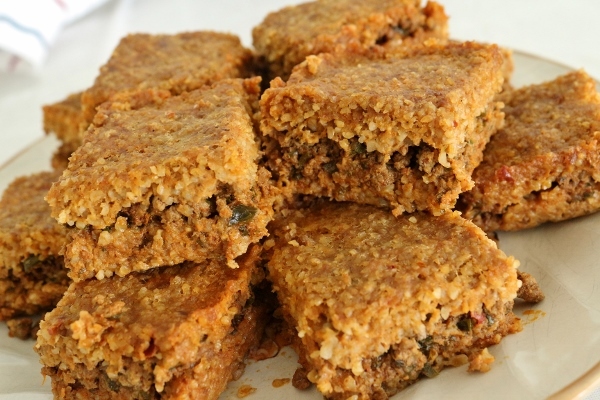 Taking it one step further, it's basically the pan version of içli kofte which is a made by combing bulgur wheat with finely ground beef, and then filling it with cooked ground beef. It's then boiled and served with lemon wedges. Içli kofte was one of my favorite dishes growing up, but it's very time consuming and requires a lot of skill to make properly. Sini kofte is a much easier rendition that boasts the same flavor profile. You also don't need to get special beef for the sini kofte that would be required for içli kofte. Standard ground beef works perfectly for both the filling and the exterior layers. This recipe is great for company and reheats really well. Serve it with lemon wedges. Start by making the gheyma. Heat the butter in a medium skillet over medium-high heat. When melted add the ground beef, stirring and breaking up into small pieces. When the beef has started to brown but is not completely cooked yet, add the onions and season with salt, pepper, and paprika. Continue to cook until the beef is well-browned and cooked through. Taste and adjust seasoning as desired. Stir in the parsley and remove from the heat. The gheyma can be made ahead and reheated as needed. It can also be frozen. Place the peeled, diced potato in a small saucepan filled with cold water. Heat over medium-high heat, bring to a boil, reduce the heat and simmer until tender. Drain any excess water and mash. Set aside. Meanwhile, place the bulgur in a large mixing bowl. Soak the bulgur with 1 cup water (or more as needed) for about 15 to 20 minutes, or until softened (you can add a bit more water at a time until the bulgur absorbs it all). Mix in the ground beef, cornstarch, egg, and season with salt, pepper, and paprika by hand. Then add the mashed potato and combine until smooth. Wet hands as needed to easy in mixing. Preheat the oven to 375 degrees F, with the rack set in the middle of the oven. Lightly grease a 13-by-9-inch baking pan with olive oil. 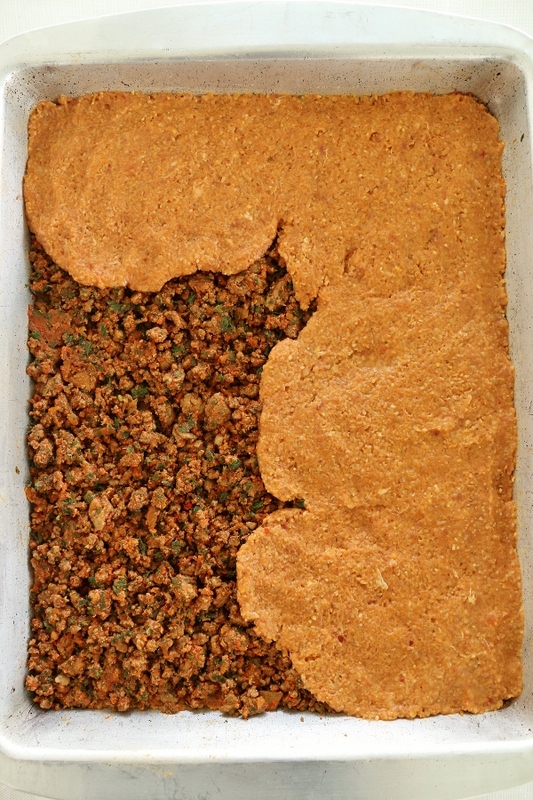 Divide the beef and bulgur mixture in half. Take large handfuls of the mixture and press them into the bottom of the pan creating an even layer to cover the entire pan (again, wetting hands will make this process much easier). 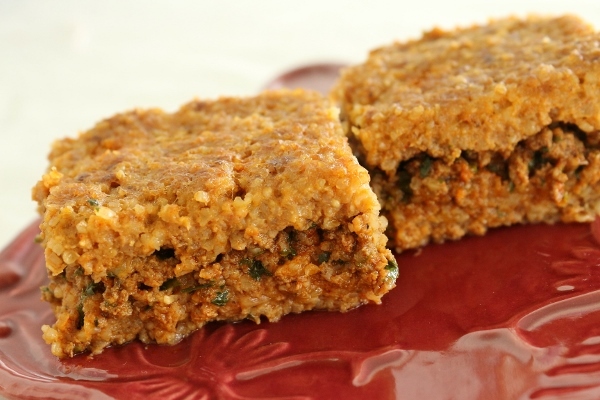 Spread the gheyma evenly over the beef and bulgur layer. Next, take large handfuls of the remainder of the beef and bulgur mixture and press them between your palms to flatten them to the same thickness you had beneath the gheyma, wetting hands between each frequently. Arrange these flattened discs of meat/bulgur over the gheyma evenly, patching them together to create a solid layer, filling in gaps with smaller flattened pieces as needed. Cut into squares about 2 to 2 1/2 inches across, wiping down the knife in between cuts (wetting and wiping the knife helps clean it between cuts). 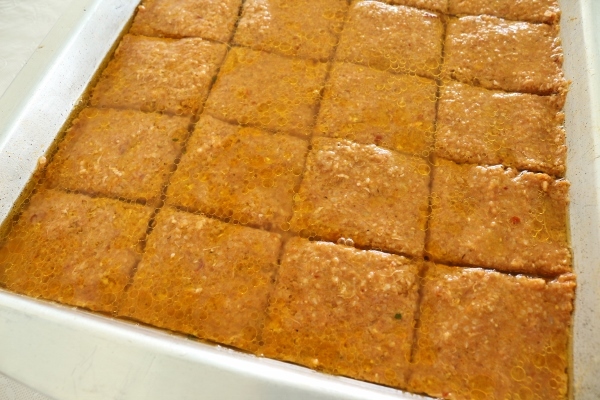 After cutting the entire pan into squares, pour the oil evenly over the top. Next, pour the water over the top. Bake, uncovered, for about 45 to 50 minutes, or until it is cooked through and the surface has lightly browned. Use a knife to cut around the edges of the pan, and in between the squares. Serve hot or at room temperature with lemon wedges for squeezing. 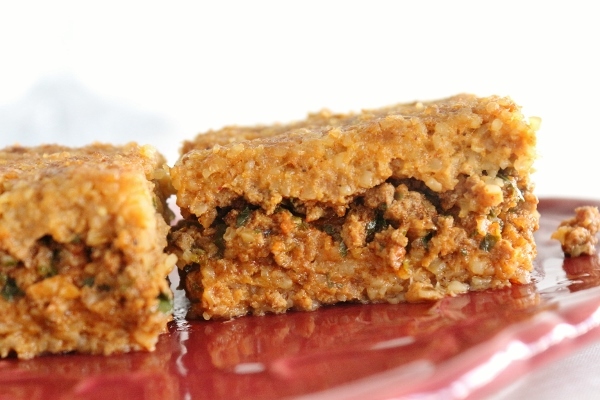 Sini kofte can also be made in advance and reheats very well.